View More In Knife Sets - Page 5. This item is a MacGyver knife with 11 functions. Stylish pearl color and dynamic line design. When folded, the size comes in one hand. It is made of stainless steel material and is durable. It is stored in a private pouch for easy carrying. Outdoor and home emergency tools such as camping, mountain climbing, and fishing can be used anywhere and anytime. 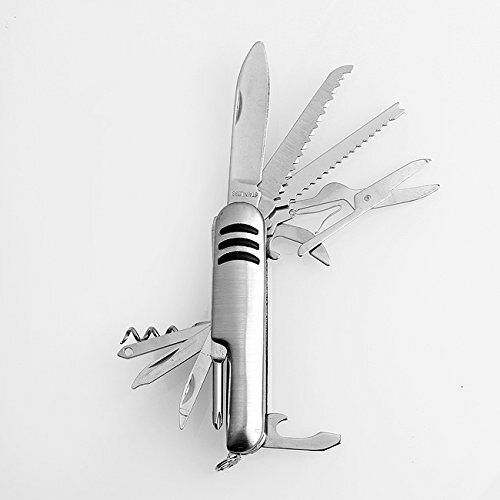 * Configuration tool (total 11 kinds) Pocket knife / scissors / saw / fish scales / can opener / bottle opener / wine opener / wire stripper / When the knife is not pulled out well, rinse it in warm water and dry it. 2. When you want to stand the blade, grind it with the grinding stone between 15 degrees and 20 degrees. If you have any questions about this product by Dometopia, contact us by completing and submitting the form below. If you are looking for a specif part number, please include it with your message.